In March 2019 we provided an update on Tanger's dividend safety here. Tanger Factory Outlet Centers is America’s largest REIT specializing in discount outlet centers. 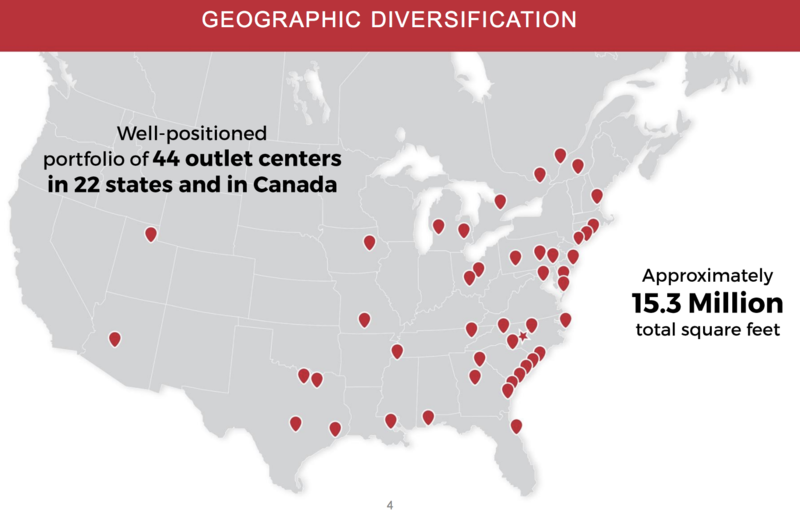 Since its founding in 1981, the company has grown to owns or have 50% ownership stakes in 44 outlet centers in 22 states and Canada, representing more than 15 million square feet of leasable retail space (over 20% of all outlet center space in the U.S.). Tanger leases its 3,100 premium store locations to over 500 high-end retailers, including Coach, Brooks Brothers, Michael Kors, and Ralph Lauren. 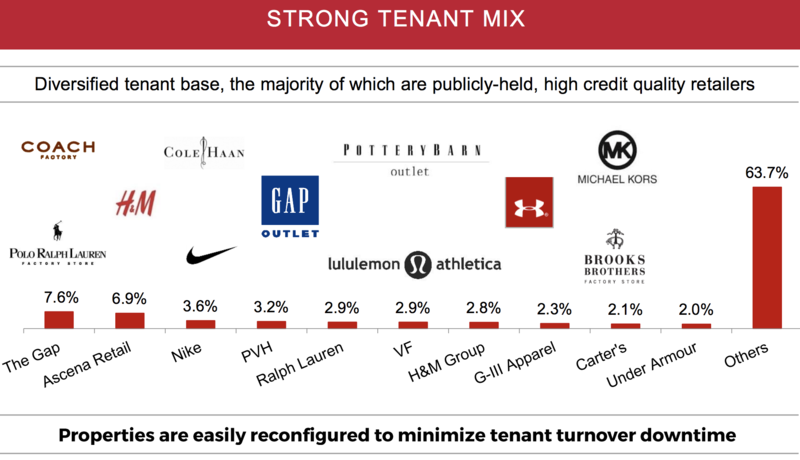 No tenant accounts for more than 8% of Tanger’s rental revenues (The Gap is the largest at 7.6%, followed by Ascena Retail 6.9% and Nike 3.6%). It’s no secret that many big U.S. mall-based retailers, such as Sears (SHLD), JC Penny (JCP), and Macy’s (M), are facing an existential crisis thanks to the rise of e-commerce and changing consumer shopping preferences. In fact, the number of U.S. store closures hit an all-time record in 2017, worse than even during the financial crisis. However, the spike in store closures and continued shift from brick-and-mortar shopping to e-commerce doesn’t mean that all malls are equally at risk. Tanger Factory Outlet Centers has several competitive advantages that provide it with a moat. For example, the REIT focuses exclusively on premium outlet centers, where high-end retailers offer deeply discounted clearance items that are hard to find elsewhere. In addition, the company has invested into turning its malls into experience centers, via embracing the latest in technology, the creation of a loyalty program, and upscale lounges that offer customers a luxury experience that Amazon (AMZN) can’t match. 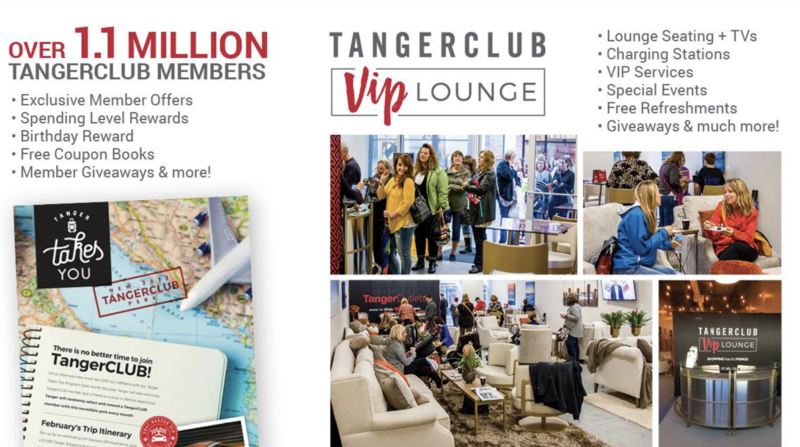 This focus on a premium customer experience, combined with the tantalizing allure of discounted luxury items, has made Tanger Factory Outlet far more recession resistant than many other mall retailers, resulting in impressively steady growth over the years. Even the most recent spate of mall retail troubles haven’t stopped Tanger from continuing to generate solid net operating income (NOI) growth. Even more impressive, Tanger’s luxury moat has helped the company maintain one of the industry’s best occupancy rates while consistently raising rent on expiring leases. The company's occupancy has never dipped below 95%, even during the Great Recession. Tanger's impressive stats, especially for a mall-focused REIT, are also the result of management's efforts to focus on a very diversified, high-quality list of premium tenants, which means that its rent is more secure than lower quality traditional mall REITs. Furthermore, Tanger’s business model is built around long-term, triple net leases. This means that the tenant pays the maintenance, insurance, and property taxes, creating highly profitable, predictable, and lower-risk cash flows. And since Tanger’s leases are staggered, the amount of its rental income up for renewal in any given year (no more than 12% through 2027) is also small enough to not jeopardize the company's overall financial health. 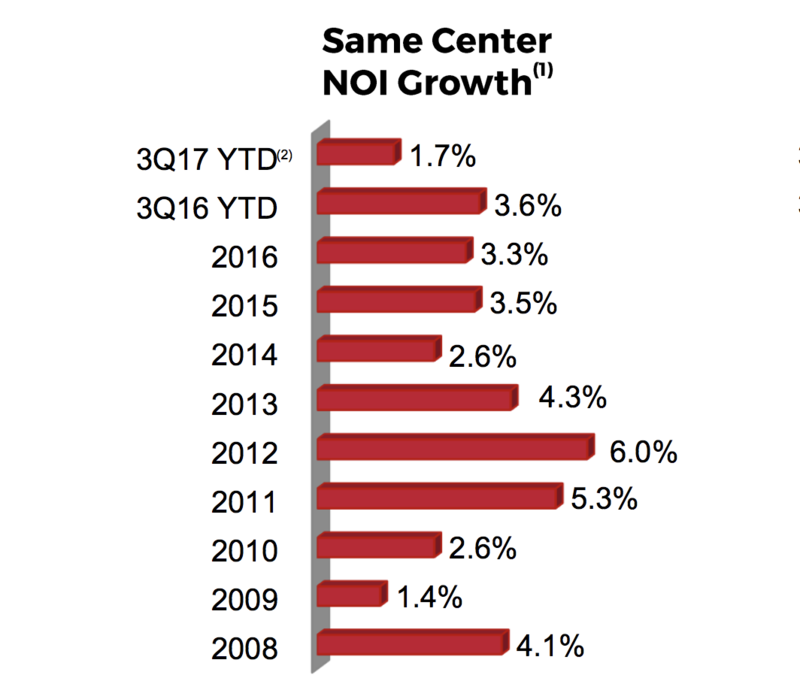 The combination of rental increases, high occupancy rates, quality tenants, and continued same center net operating income (NOI) growth has helped Tanger consistently generate high operating margins in excess of 30%, a testament to the company’s experienced management team. Another aspect to Tanger’s moat is the fact that management is highly disciplined in their growth efforts. For example, unlike traditional mall retailers, which are suffering through an oversupply in retail space, Tanger has been slow to open new factory outlet center locations. That’s because management doesn’t invest shareholder capital unless it’s very confident that it can maintain very high occupancy, with long-term leases that make for both high profitability and very stable cash flow. In fact, thanks to the small size of the factory discount outlet industry (70 million square feet, less than the retail space in Chicago), this niche retail industry continues to generate very high profitability. And Tanger, as the best-in-breed operator with economies of scale, has been able to generate even more impressive returns, including a very high margin that has allowed it to grow its dividend every year since its IPO in 1993. Besides paying generous dividends, Tanger continues to invest in its future growth, completing work on two centers last year. The high cash yields (8-11%) on these investments are further evidence that Tanger remains committed to its “quality over quantity” approach to growth, which bodes very well for future payout growth. Thanks to Tanger’s industry-leading track record of compounding shareholder income and wealth, the REIT also enjoys one of the lowest costs of capital in the industry. That’s due to its high percentage of retained cash flow (i.e. a relatively low cash flow payout ratio for a REIT), as well as its plentiful access to cheap debt. A low cost of capital ensures that Tanger is able to grow profitably over time by maintaining a positive spread between the cash yields it achieves on its properties and the cost of capital it obtains by issuing equity and debt to fund its capital-intensive growth investments. 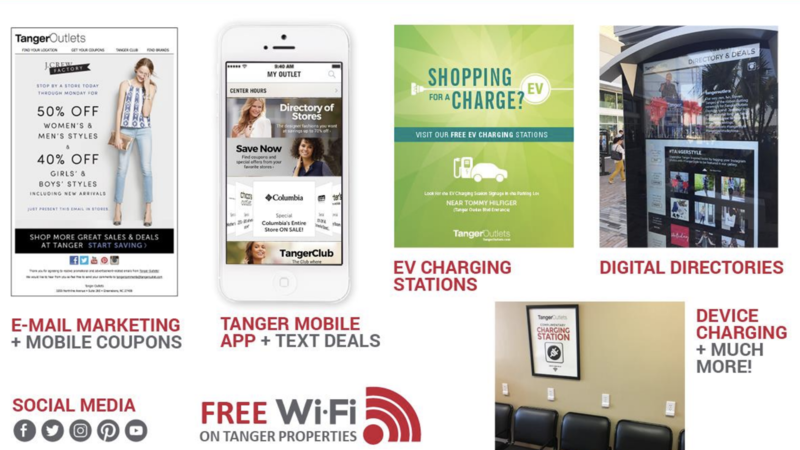 While the retail landscape is experiencing significant change, Tanger's business concept has thus far remained on steady ground. The company's solid financial health also provides it with flexibility to weather any unexpected downturn and make investments to adapt to changing consumer preferences. However, the business ultimately depends on outlet center shopping remaining a popular concept in the years ahead. The factory outlet center business is one of the few bright spots in retail, because even struggling retailers such as The Gap (GPS) are looking to discounted outlet stores as growth opportunities while they close traditional mall locations. This, plus the fact that shoppers still tend to view outlet shopping as a unique “event” experience, means that the industry could prove to be less vulnerable to being disrupted by e-commerce than some investors expect. However, the success of outlet centers is also a source of risk. 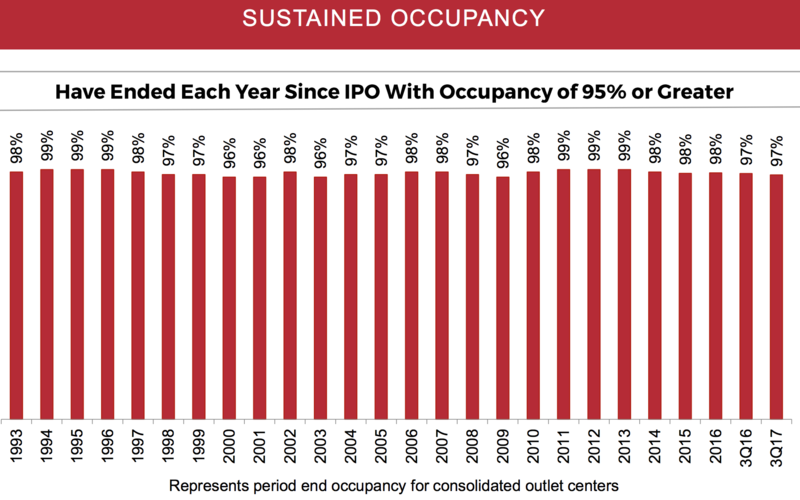 While the outlet industry represents less than 1% of U.S. retail space, the positive aspects of the industry are starting to attract more competition from other large retail REITs, including Simon Growth Properties (SPG), Taubman Centers (TCO), Macerich (MAC), and CBL & Associates Properties (CBL). In other words, the growing popularity of Tanger’s niche business model could result in the same kind of oversupply situation that is now killing the low quality mall industry, resulting in falling profitability and numerous dividend cuts among highly leveraged mall REITs. You can see that the U.S. has much more shopping center space per person than any other major developed country in the world, making this an important risk to remain aware of as shopping center operators increasingly scramble for different opportunities for profitable growth. Next, while Tanger’s premium list of tenants might make it less vulnerable to e-commerce, that doesn’t mean the company is totally immune. After all, Amazon and outlet stores are competing for the same customers, those who value deep discounts. Tanger’s investments into a luxury shopping experience offer a way to differentiate from online retail, but customer preferences can still shift over time. It’s possible that the value and convenience proposition of Amazon may eventually overcome even Tanger’s moat in the future. For example, one of Tanger’s largest tenants, Ascena Retail (ASNA), which operates stores such as Lane Bryant, Anne Taylor, and Dress Barn, has lost foot traffic recently due to shifting consumer preferences. Even the kinds of premium luxury brands that are the core of Tanger’s business model aren’t totally immune from the growth of online retail. Finally, we can’t forget that Tanger, like all REITs, can be highly sensitive to interest rates. That’s not just because the REIT business model is highly capital intensive and requires a lot of external debt financing, but also because higher interest rates generally cause a REIT’s share price to decline and its yield to rise given their bond-like qualities (slow growth, long-term lease contracts). Since Tanger is frequently tapping the equity markets for growth capital, a higher yield (and a lower share price) means a higher cost of equity, which can raise the company’s cost of capital and make it harder to find profitable growth opportunities in the future. If competition increases from rival retail REITs opening new outlet centers, pushing down future returns on property investments, a rising cost of capital could be particularly problematic. While Tanger’s large percentage of internally funded growth (via retained AFFO) means that it will be able to continue growing profitably even in a higher rate environment, the potential for decreased profitability means that its ability to grow the dividend quickly might decline in the years ahead. Despite the turmoil in brick-and-mortar retail, Tanger Factory Outlet Centers appears to be one of the high quality REITs that is likely to survive for many years to come thanks to its conservative management team, strong balance sheet, low cost of capital, and quality property portfolio. Future growth is a much bigger uncertainty, especially given the company's concentration in a single store concept (discount outlet centers). For income investors interested in playing the role of contrarian in the retail space, Tanger appears to be one of the fundamentally strongest companies to consider as part of a well-diversified dividend portfolio.